A long-time member of the North Island Rhododendron Society, Mary Palmer, has always carried more than her share of the work load. She can be relied upon to assist in club activities, shows and sales at any time. Mary has produced the newsletter for our club for many years and has always managed to maintain a high standard which is of interest to all. Mary was also instrumental in compiling and producing the booklet “Rhododendron Fundamentals” for the benefit of all the members. 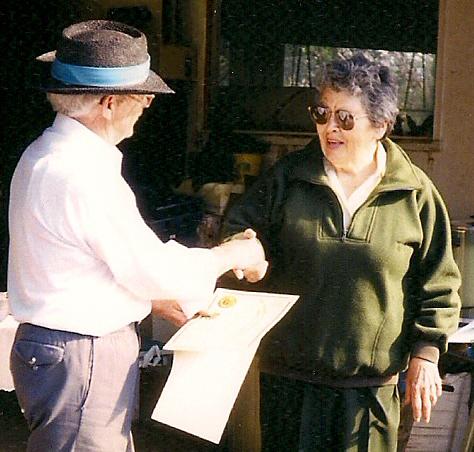 In appreciation for her many contributions, the North Island Rhododendron Society is pleased to present its highest award, the Bronze Medal, to Mary Palmer on June 15, 1996.